The weighted sides are great for keeping out any light and the weighted eye pad part feels just right. It lays perfectly across your face very easily and stays in place. The mask is perfectly weighted. It blocks all light, stays cool over the face and eyes and has granted me a restful night's sleep, every night. I highly recommend it. The weighted sleep mask is a well made product. It does it's job. I would like it to have a little more weight. I suffer from chronic migraines. 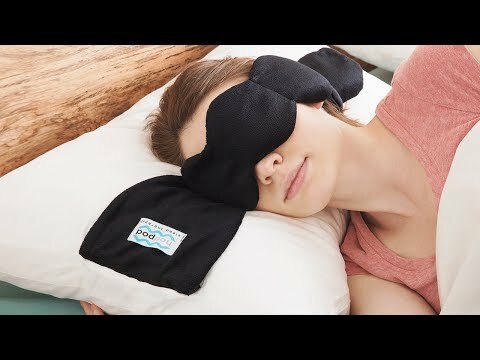 This sleep mask, when frozen, has helped save me numerous times so I'm more functional. The weighted pads are just the right amount of pressure, & I love that it's washable. It’s wonderful! It raps neatly around your head and assists in getting you into a restful place! Thinking of buying more as gifts! 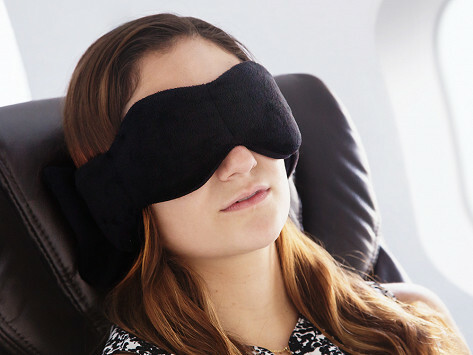 This weighted sleep mask gives a calming sensation. It works so well when I wake up too early and need to go back to sleep. I ordered a dozen to give as holiday gifts. We are discarding all the eye masks (probably 1/2 dozen) we have purchased over the last couple of years. The “NodPod” is the best! I can finally read before turning out my light because my husband is so comfortable with the “NodPod.” It completely blocks the light and feels great. Thanks - again! I really like that it's weighted, stays right where I want it. Getting stress headaches are a challenge, but this helps with relief. I am really light sensitive especially when my wife wants to read before retiring. I normally use a traditional strap-on sleep mask. I thought I'd try this new version. Whoa Nellie! It's so much more effective. I now get more sleep because it is so darkening as I go to sleep and in the morning as the light eases into the bedroom. And it stays in place. A great product! When it comes to sleeping, Maker Melissa Bamberg figured out how much pressure is just right. Her weighted sleep mask started off as a light-blocking eye-mask. After some research and restless sleep, Melissa uncovered the benefits of deep pressure touch therapy. Just like a hug or the swaddling of a baby, our bodies respond positively to pressure. NodPod can help relieve stress, headaches and—after a stint in the freezer—can even help relax muscles. Its micro-bead pouches apply gentle (but constant) weight, creating pressure-perfect conditions for a soothing rest on the go. Its snap- and strap-free design is easy to pack and travel with. And for at-home dozing, there’s a version that snaps to the edge of your pillowcase so it's always within reach.